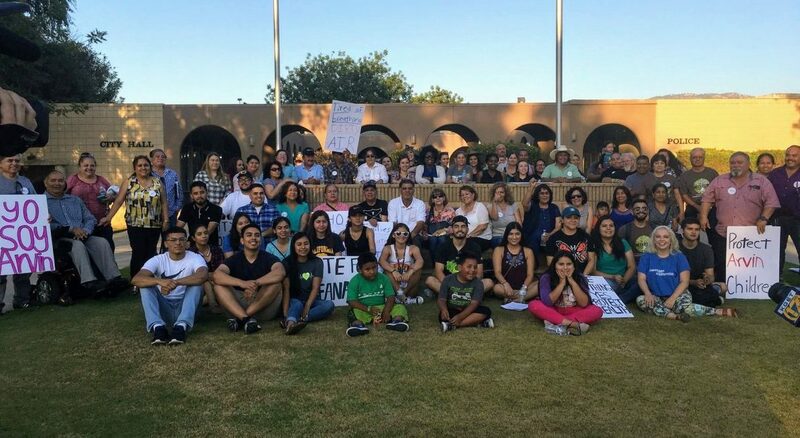 The victory that took place in Arvin on July 17th, 2018, was only part of the decade-long work by the community and organizations representing environmental justice in Kern County. The grassroots victory reflects the power community has to create true systems change and how community science projects can be an unprecedented tool that helped leverage one of the most important victories in Arvin to protect public health. Poverty & the Environment (CRPE) and the Central California Environmental Justice Network (CCEJN). It is worth recognizing the support we received from the Building Healthy Communities South Kern’s Communities United Action Team as well as from other remote partners such as the Center for Environmental Health (CEH), Earthworks, Californians Against Fracking and many more that supported the people of Arvin and their fight for environmental justice. and gas leak in the neighborhood of Nelson Court near Arvin’s high school. CCEJN staff, Gustavo Aguirre Jr. took an air sample and verified that fact. By 8 pm, half of the residents in the Nelson Court area were evacuated from their homes after being told there were explosive levels of gas in their homes. It took 8 months of scapegoating, pointing fingers, and lack of follow through from public agencies about who the responsible party was to remediate the damages inflicted by Petro Capital Resources, the oil and gas operator responsible for the negligence and the gas leak. from across the state toured the community of Arvin to witness first-hand where these monitors are located and how close wells and storage tanks are from schools, homes and parks. It took years of collective work to pull this victory off. It took community reporting and community data collection efforts to showcase and ground truth the years of advocacy around air quality. It took the people of Arvin to stand up and say, “I have the power to create change and our own narrative for the future generations”. And well, Si Se Pudo.